Last week Claudia Eipeldauer and me gave a workshop in how to make interactive animations with the open source software “PROCESSING“. 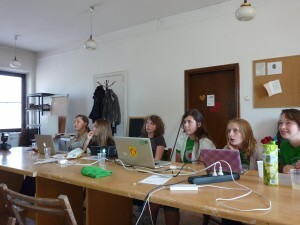 This workshop was part of an EU project called “Suburbs” organised by the Academy of Fine Arts in Krakow. The kids were between 12 and 15 years old and were programming small java applications that use the mouse position or the webcam as input to control graphics.